Elimination Communication: Yes, you can have a diaper-free baby! Our infants used the toilet. Yep. And they didn’t complain, either. I had heard about elimination communication before, and it all made sense to me. After all, there’s people all over the world who don’t have access to diapers, and they seem to fare just fine. Even though I had thought of it and intended on doing it, the first two weeks of our firstborn’s life were a real whirlwind. I was one of the rare women who actually didn’t have milk to feed her kid, and it was absolutely heartbreaking, because I was committed to breastfeeding. The story of why I didn’t have enough milk is long (and a post for another day). My milk did come in eventually, on day 8 (it’s supposed to come in by day 5), but it took a lot out of us to get to that point, and I couldn’t even fathom adding more to our sleepless nights and days. So EC went on the backburner during that time. But after we sorted out the breastfeeding issues and K-girl regained the weight she’d lost, EC came to the forefront of my mind again. Especially after the 15th time she peed all over the change table as soon as I took off her diaper. So the next time, I knew she’d pee as soon as I took off her diaper, so instead of waiting for her to make a mess on the change table (which I’d then have to clean), I just took off her diaper while I held her over the toilet bowl. And voilá; our EC journey began. Elimination Communication is the practice of listening and watching for you infant’s cues to understand when they need to pee or poop, and then offering a potty or holding them over the toilet bowl. This practice receives much criticism from those who don’t understand what it’s all about. Early childhood “experts” will tell you that potty training before 18 months of age is harmful to a child’s development, but they’re forgetting a majorly important thing: elimination communication is NOT potty training. Also, the 18 months advice is suspect, because the lead investigator for the study was one of the people who also sat on the board of directors for… wait for it… drum roll please… Pampers. You don’t need to be a genius to figure out that this study was just a tad biased. Then there’s the people who’ll say, “well, that’s really just training the parent.” Well, guess what? So’s breastfeeding on demand. so I guess you could say all my kids had me very well trained. Folks, calm down. Elimination Communication is not what you think it is. First of all, what do you think happened before they invented diapers? What do you think still happens all over the world, where people don’t have access to diapers? Elimination Communication is what happens. They just don’t call it that, because in their culture, they don’t need to explain it—it’s the norm. In China, toddlers wear “open crotch pants”—no diapers needed. When they need to go to the bathroom, they simply pee or poop out of the hole. The Digo people of rural Kenya read their infants’ cues and hold the babies over the ground when they need to pee or poop. Elimination Communication is not new. Moms have been helping their babies pee or poop without the aid of diapers for millennia. There’s nothing “modern” about elimination communication, and there are many reasons people are going back to this practice. For some, it’s just one way they’re attentive to the needs of their baby; for others, it’s an environmental choice, and for others, it’s about cutting costs. A combination of all of the above made us decide to go the elimination communication route, but you should know that we really did a combination of things. We used EC, cloth diapers, and yes, disposables, too (GASP!). We did EC most often with our first baby, but we really did it with all three. The best part? Our kids were completely diaper-free early, and we never actually had to “potty train.” Our kids were familiar with how a toilet works from the time they were infants, so there was no big introduction or new thing to get used to. Some people thought we were weird for doing this. I personally think that letting a kid sit in their own waste for two hours is weird, but hey, what do I know? 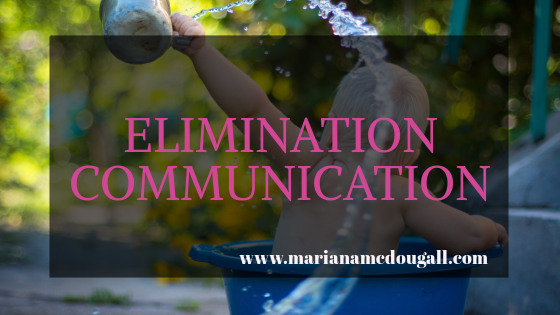 Elimination Communication is a great way to take care of one of your babies’ needs, but like every other parenting choice, it’s not for everybody. If you’re curious about EC, a great resource is the Diaper Free Baby website. Another resource that helped us greatly in our EC journey was the book Diaper Free Baby, by Christine Gross-Loh. Want to learn more about the “crazy things” we’ve done while raising our kids (and how you can try them, too? Sign up for the mailing list below!